The processing of Kevlar to certain strengths by hot-drawing can benefit by quantitative understanding of the correlation between structural and mechanical properties during the pre-drawing process. Here, we use a novel continuous dynamic analysis (CDA) to monitor the evolution in storage modulus and loss factor of Kevlar 49 fibers as a function of strain via a quasi-static tensile test. Unlike traditional dynamic mechanical analysis, CDA allows the tracking of strain-dependent mechanical properties until failure. The obtained dynamic viscoelastic properties of Kevlar 49 are correlated with structural data obtained from synchrotron radiation analysis and with Raman scattering frequencies. 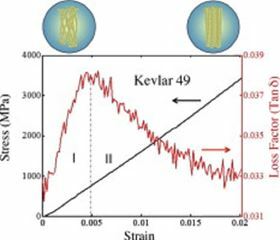 Rate-dependent stress–strain results from Kevlar are compared to Nomex, spider silk, polyester and rubber, and provide insight into how the mechanical properties of Kevlar originate from its characteristic structural features. We find that as the storage modulus of Kevlar is essentially equal to the Young's modulus, the measured quantitative relationships between storage modulus and strain can provide insights into the tuning of the mechanical properties of aramid materials for specific applications. This paper was originally published in Materials Today Communications, 2 (2015), Pages e33-e37.